A sacred festival dedicated to tripe? Not very likely to happen in the English speaking world I’d imagine! But the Abruzzesi once again excel, not least in allocating not one but three nights to the enjoyment of this divisive dish. The annual Sagra della Trippa hosted in Villa Maggiore in Abruzzo could only occur in a country like Italy where the cooking of fresh food daily is still regarded as a skill rather than a chore. It would be impossible for such a ‘delicacy’ to be anything but rubbery if presented as a TV dinner to be reheated in a microwave, though to be honest the sight of tripe packed in partially transparent plastic destined for the microwave would probably have all but the hardiest of offal-eaters making a dash away from it at the supermarket. Back to this small Italian farming village’s festival that celebrates Tripe! On each of the three nights a different tripe recipe is presented served with bread and, for those that cannot do without their real meat, arrosticini (skewers of grilled bite-size portions of lamb made popular by the local shepherds as they wound their way down to Puglia as part of the Transumanza). After buying your food & wine tickets for the bargain price 15 euros all in for 2 people; comprising a ½ litre of wine, 2 bowls of tripe, bread and arrosticini & bruschetta, you pass on your tickets to local food stands and sit down on long, shared tables where you are served by the almost officious local children who seem to relish their new-found roles of playing adults, ordering you to eat up and demanding “have you finished?” whilst whipping your near-emptied plates from under your nose with precocious severity. We sat next to and talked with a lovely matriarch whose passion for tripe was expressed with joyous gusto (she was attending the sagra every night). A passion only matched by that she had for the magnificence of the cakes made by the local pasticceria (cake store) owned by her family, something that all ad companies could do with canning – she could sell an egg to a chicken! We were presented with a big warm bowl of what we have only had previously been served as antipasti. Melt in the mouth honeycomb tripe in a rich lemony tomato sauce with a touch of peperoncino that was just wonderful and warming. A late August storm had just passed by so the warming character of this dish was much appreciated. Whilst writing I am imagining the disdainful wrinkling of noses by some as they read this. I remember once, whilst studying in Florence during my vegetarian ‘phase’, my friend’s Nonna with whom I lived tried to pretend that the tripe she had served me in tomato sauce was in fact only gnocchi; “outrageous!” I thought as I pushed the bowl away from me contemptuously, morally repulsed but somewhat hypocritically finding the taste & texture quite yummy… For those averse to the notion of eating tripe, please be aware – if you eat haggis you can eat tripe; if you eat a textural fish like octopus you might also enjoy tripe; if you believe in a very low-fat protein-rich diet – you should try tripe! 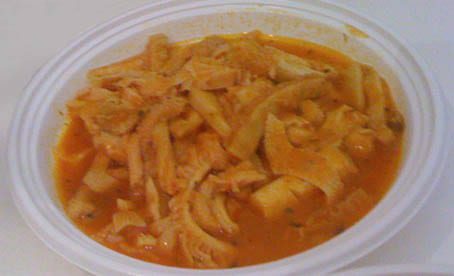 ; if you are like everyone watching your purse you should def consider tripe, and if you believe in attempting to consume all eatable, flavoursome parts of an animal that has in affect died for your consumption you would be accused of crass dishonesty were you not to indulge in tripe. Gordon Ramsay recommended it on TV in the UK and sales rose by 400% in 2007, so all those looking for an alternative career selling something that is actually good for you and the people that consume it here’s a product that is just raring to go! After the tripe feast, the sagra begins in earnest with a game of guess the weight of the prosciutto, and everyone getting jiggy to Rapsodia Band – local traditional music that seems to have been mixed with Berlusconi’s idea of family entertainment; semi-scantily clad girlies accompanying a squeeze box/accordion. All husbands (good or not-so-good I daresay) swept their partners off their feet and got smoochy before all responding to some subtle (possibly subliminal?) signal that it was time to come together & indulge in one of the USA’s greatest cultural exports – line dancing! It’s been embraced with a passion here, why god why is my biggest question, but hey if you like line dancing and fancy a holiday take advantage of a holiday in Italy in August visiting the local sagre and you will get plenty of practice.